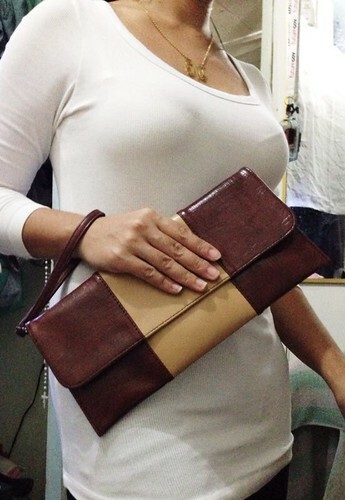 Fashionable Big Clutches Under P500! I have shopped for a few stuff this week. As always, I was on a budget so I really made sure to find cheap items that would satisfy me and wouldn't compromise my comfort, fashion and style standards. Allow me to share with you the two cheap yet trendy big clutches I got. One was from Something Borrowed (via Zalora, a local online shopping site) and the other one was from Liberte (via Robinsons Department Store, Robinsons Place Manila). 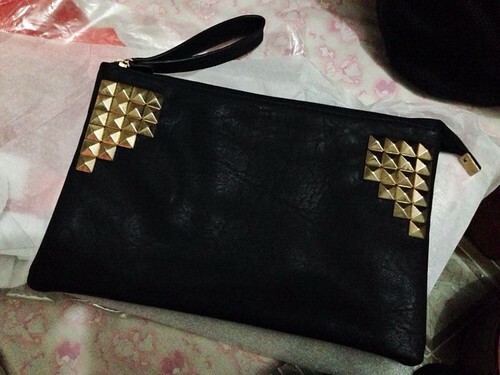 The studded, black big clutch is fun and fierce at the same time. 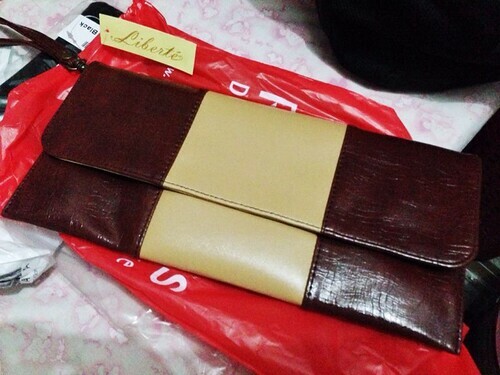 I got it for P499. It was on sale at 50% off, the original price being P998. Zalora is a great shopping site, they always have a variety of items on sale. You'll also love their fast, seamless service. It's my second time to shop from the site and I'm quite satisfied with how they handle things there. The red brown/beige combo, on the other hand, speaks elegance and style. I bought it for just P330. Liberte is known for its cheap yet stylish pieces, just check out their collection at all Robinsons Department Store and see for yourself. I can imagine myself pairing the two big clutches with dresses (when I'm off to some casual event) and trousers/shorts (when I'm going to a meeting, hanging out with friends or just hitting the mall). Actually, I think I can use them in virtually all occasions. Yes, we're talking about versatility here. When buying an accessory like clutches/clutch bags, one should look for affordability, versatility, style and overall look.